Mani Sharma Yanamandra (born 11 July 1964, Machilipatnam, Krishna District of Andhra Pradesh) is a music director known for his works in Tollywood. Podagatlapalli near Ravulapalem in East Godavari District is his native place. He has composed music for over 140 films. He is popularly known as "Swara Brahma" for his contributions to music in Tollywood. 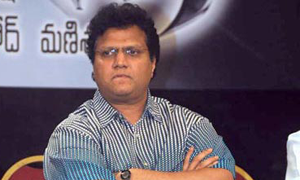 Mani Sharma started his career as a music director in 1998. Before that Sharma used to work as a keyboard player for Raj-Koti, M. M. Keeravani. Mani and A. R. Rahman had both worked for Raj-Koti as keyboard players. Then Mani became a part-time music director by composing background scores for films of Ramgopal varma and others. Then he was approached to do the background score of Antham (Drohi in Hindi). Varma asked him to compose a single song for his film and he agreed. Then he continued to compose background music for other films like Raathri (Raat), Preminchukundam Raa etc. His first film as a full-time music composer was Super Hereos which was produced by Suresh Productions. Later he got break in Megastar Chiranjeevi's film Bavagaru Bagunnara. He composed music for all time biggest hits Bavagaru Bagunnara?, Choodalani Vundi, Iddaru Mitrulu, Jai Chiranjeeva, Stalin, Anji, Indra, Tagore, Annayya, Kushi, Theenmaar, Samarasimha Reddy, Narasimha Naidu, Aadi, Lakshmi Narasimha & Pokiri. His recent hit films are Pokiri (Telugu and Tamil), Chirutha (Telugu), Billa (Telugu), Athadu (Telugu), Athidhi, Yuvatha, kantri, Rachcha (Telugu) and many more. One of his achievements is after 'Bavagaru Bagunnara' Chiranjeevi took him as a music composer for a huge majority of his films till Stalin (1998�2006). One of his greatest compositions was Cheliya Cheliya from Kushi.